A majority of Americans support an interim deal with Iran that would ease some economic sanctions on that country in exchange for concessions on Iran's nuclear program, according to a new national poll. 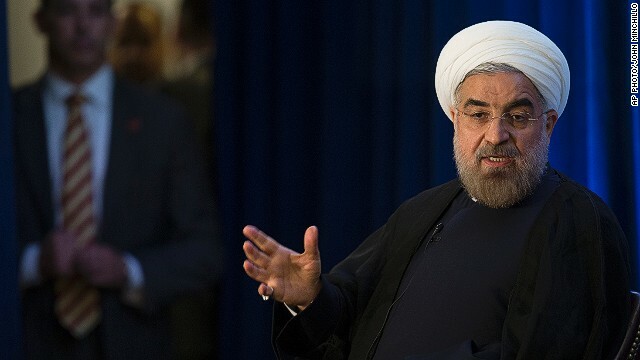 A CNN/ORC International survey released Thursday indicates that 56% of the public would favor an international agreement that would impose major restrictions on Iran's nuclear program but not end it completely, with 39% opposed to such an agreement. "Predictably, there is a partisan divide on that issue, with two-thirds of Democrats favoring a deal along those lines but only 45% of Republicans agreeing with that view," CNN Polling Director Keating Holland said. AND THEY SUPPORTED OBAMACARE AND WOULD READ IT LATER. we said-you cannot enrich uranium or we will not have a deal. They said-we will not stop We said-ok you have a deal. obama and kerry have one oar out of the water to even deal with a country that kills people who even read the Bible, who sponsor terrorist, but they got just what they wanted. OBAMA YOU DUMMIE-THEY CAN PROCESS THE URANIUM AND GO FROM 20 TO 5% BUT SINCE YOU ARE LETTING THEM KEEP IT THEY CAN REVERSE THE PROCESS AT ANY TIME-REMEMBER KOREA???? This was a remarkable achievement by any stadard. Republicans will swoon on cue and wake up screcching and running around like a headless chicken but normal people know better. Habemus president!!!! Yeah, that's great. Too bad Chuck Schumer is getting ready to introduce bipartisan legislation strengthening the sanctions against Iran because of his distain for the deal the administration made. Before you slam republicans, check your own arty first. CNN would love you to believe that governing by poll is legitimate. Just call it Obamiran, and you'll have it. A majority of Americans shouldn't be allowed to vote due to lack of understanding of the situation. today the chant in iran is "I wish 'death to America' soon is reality." That was this morning not in the 80's. How dumb can we possibly be. Obama I hold you directly responsible. Mccain time to get loud sir.